And lo, page 267 has crawled out of the primordial ooze! Read it, and then read these notes. 1. It was a very fun challenge to take Abi’s drawing of the Nazi commander and adapt it to my style. I tried very hard not to change any of the essential elements. 2. The little “ping ping ping” noises from Chrysanthemum’s detector are an obvious reference to Scott Free’s Mother Box. I know LC well enough to know he wouldn’t object to that additional detail. 4. I was so happy with the expression I put on Beowulf’s face as he prepares to gleefully pummel some Nazis, that I immediately sent a close-up of the panel to Leighton. 5. Josh is correct, I was happy to see the “ping” sound effects. I also really like the tracking gizmo he designed. I am confident that Beowulf could not work that thing. 6. 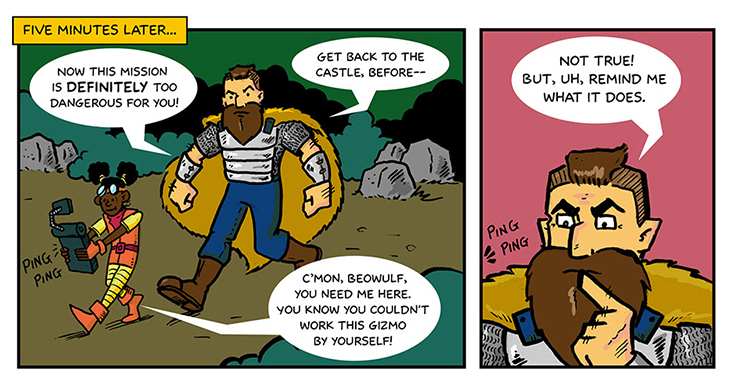 Josh mentioned Beowulf’s gleeful look in the last panel, but I also really like his perplexed look in panel 2. Hilarious! 7. The shape of the plot could have gone a few different ways. We knew this story was about Beowulf and Chrysanthemum going to warn the fairies about the Nazis, and we knew they would fight the Nazis. But I wasn’t sure if our heroes would a.) Get to the Fairy Fountain before the Nazis, b.) Run into the Nazis on the way to the Fairy Fountain, c.) Get to the Fairy Fountain, only to discover that the Nazis had followed them there, or d.) Get to the Fairy Fountain only to discover that the Nazis had already gotten there. I listed these options to Abi, and she chose d. Which I think was probably the best choice. 8. Oh man, I wonder what’s in that coffin. 9. When the Electric Team fought Nazis in issue 8, all the Nazi dialogue was in German, with no translations. I thought that was cool. They didn’t have a lot of dialogue anyway, and you didn’t have to read it to understand the story. In this story, though, I broke down and did the translation thing. You need to know what the General is trying to do here. 10. We restrained ourselves and took three whole pages to get here, but next week–it’s the Nazi fightin’ you’ve been waiting for!